Why Read Information Books With Your Child? Good readers are actively involved in what they read and think about a story as it is read to them. Researchers have found that good readers and learners can pick out the most important parts of a story and restate the information. The ability to recall and retell a story helps clarify its meaning and leads to better comprehension. Story retelling helps kids see the different parts of a story - the beginning, the middle and the end - and how all these parts fit together. Retelling doesn't mean memorizing - it means recounting the story in the child's own words. Parents who engage children in conversations while reading a book encourage reading comprehension skills. What Research Has to Say About Reading Instruction, International Reading Association. Retelling Stories Boosts Kids' Understanding, Northwest Regional Educational Laboratory (2003). Good readers can retell a story from beginning to end, adding important ideas and details. Who was the story about? Where did the story take place? What happened at the beginning? What happened in the middle? This is called the 5 Finger Retelling Strategy - one finger for each important question. Good readers also act out stories they have read and enjoy creating new twists and endings to familiar stories. Record each day's weather on the calendar with symbols for sunny, rainy, windy, cloudy, etc. at the end of the month, count each kind of day. Read five books from the "Talking" book list. 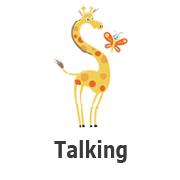 Watch a science or nature program and talk with your child about unfamiliar words or concepts. Go to the Library and check out an information book related to the science or nature program you watched. Talk about questions you have and read the book together to find answers. Simple directions and explanations are a great talking activity. Ask your child to do three unrelated tasks and see if they can follow the order, “Put on your shoes, pick up 2 toys, and sing Twinkle, Twinkle Little Star.” Provide opportunities for your child to practice his budding directorial skills too! Being able to put events in a logical sequence will help your child understand, comprehend, sequence and retell stories.